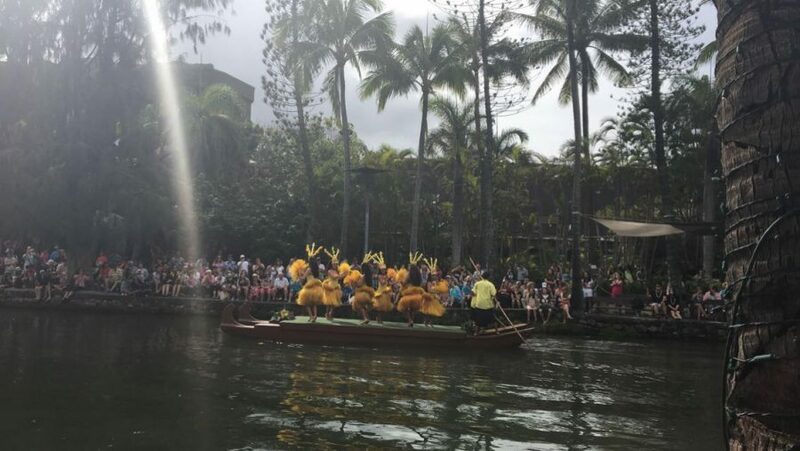 On her third day in Hawaii, Brown and other band members saw a canoe pageant. After a buffet breakfast at the hotel, we were off to two great adventures for the day. We were headed to the Dole Plantation, and from there we went to the Polynesian Cultural Center. At the Dole Plantation, we first got to do a maze and try to find checkpoints within the maze. It was a maze of trees and plants in the shape of a pineapple in the center of it. It was a large and confusing maze, which made it easy to get lost. After an hour of wandering around, a lot of students decided to try the Dole whip. The line was long, but it was worth it. Dole whip is a pineapple ice cream, and then you could get pineapple as a topping. Next, we traveled to the Polynesian Cultural Center, stopping to look at a few surfing beaches on the way. The Center had multiple islands all explaining the different Hawaiian cultures. It was very informational and fun with the different shows and activities. I first went to the Canoe pageant, which consisted of different tribal dances and routines performed on a canoe. After the pageant, I went on a canoe tour that told me about all the islands. The center consisted of the islands of Samoa, Tonga, Aotearoa, Tahiti, Fiji, and Hawai’i. At the Samoa we got to make a fire, weave a fish out of coconut tree leaves, and watch a show about the civilization. The show was very entertaining, including people dancing with fire and climbing coconut trees. The narrator was very funny and knowledgeable. In various ways, we learned about how the men do all the house work in Samoan Culture. In Tahiti we were able to get tattoos of warriors. Also Tahiti offered a wedding ceremony, dancing lessons, and fishing lessons. Last I went to see a 4D movie called the Hawaiian Journey. It was mostly about ancient Hawaiian culture and Hawaii’s beautiful landmarks. The whole group then met for dinner at the island buffet. There were a variety of foods and desserts offered. Some of them were Hawaiian based and some were not. Everyone enjoyed the food, and I loved trying new island foods. The night ended with a cultural show that included a story told through song, dance, and acting.